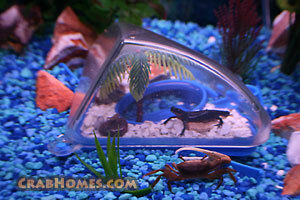 Would you like to have an Amphibian Terrarium at the bottom of your fish tank? Did you even know that such a thing exists? Well, it does and it is revolutionizing fish tanks all over the world. An amphibian is "any cold-blooded vertebrate of the class Amphibia, comprising frogs and toads, newts and salamanders, and caecilians, the larvae being typically aquatic, breathing by gills, and the adults being typically semiterrestrial, breathing by lungs and through the moist, glandular skin." That is a large definition but it lets us know that adult amphibians have to breath air which means that they cannot just get it from their gills in the water like fish can. In the past, home grown amphibians had to be transported from water to air several times a day. This is a thing of the past. With our new revolutionary Amphibian Terrariums (Atlantis Underwater Island) any amphibian can breath air at the bottom of any full size aquarium. How is this done? We have developed a system that allows air to flow into an amphibian terrarium at the bottom of your fish tank without disturbing the natural habitats of the fish surrounding it. In fact, this is one of the most natural ways for your amphibians to live. They need air, they need water, they need food, and all of this is possible with Atlantis Underwater Island. And its not only possible, its easy. As soon as you install one of our amphibian terrariums in your aquarium your amphibians will start to get familiar with it. It will eventually climb into the air pocket and that’s when it learns that it now has a new home. It has a perfect resting place to get air, eat crickets or other food and get the necessary rest that amphibians require. Your aquarium will never be the same after you add an amphibian terrarium. The character that it adds is definitely priceless and the value that it adds to the lives of your amphibians is priceless. No more transporting amphibians from one tank to another. Its as easy as setting up your crab terrarium and waiting for your amphibian to learn that he has a new home right at the bottom of the tank.